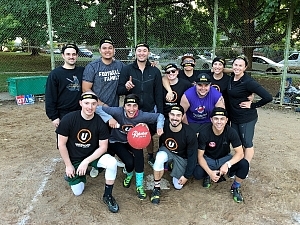 Just as it happened all season long, the upstart La Kickaracha kids rode some momentum from a Red Rubber softcore title straight to a dominating win over 2 Legit 2 Kick in the finals. Big kicks from Kieran, Mike (all 3 of them) and Anisa powered the offense, while the team continued to take the bunts away from opposing teams with laser beam throws to 1st. Great season guys! Get some rest and come out swinging in Winter!